The Hebrew word gibush (גיבוש) is often translated as “bonding,” but it is so much more. It is growing as a group, team spirit, breaking down barriers, and unification. As 9th graders beginning their high school years (and typically welcoming some new faces to the grade), gibush is a primary goal of Na’ale - Golda Och Academy’s 10-day trip to Israel which I have the honor of facilitating and guiding. Studies show that developmental growth is most dramatic when one is outside the comforts of home. For our Na’ale participants, (who just returned from Israel last week) the long hours on airplanes and buses, sharing hotel rooms with each other, and engaging in challenging activities together stimulates growth as a group and breaks down social barriers that may have been formed in the confines of the school walls. We intentionally begin the Na’ale experience with donkey riding in pairs (one leads while one rides) and two very challenging hikes. During the hike of the Arbel mountain overlooking the Kineret, I heard crying and complaining amidst laughter and applause. I saw students grasping hands and directing one another to navigate an obstacle in the path. Most of all, I heard wonderful interactions and vibrant discussions, made possible by the unique setting in nature without the distraction from phones or the pressures of daily life in New Jersey. I am quite confident that the 9th grade that landed in New Jersey was a more unified and bonded class than the one that had boarded in New Jersey 10 days earlier. Two and a half days of the Na’ale trip are spent in our partnership region Merchavim with the 9th grade class of the regional high school. This is a unique feature of the trip. Many 10-day trips to Israel will consist of visiting “all the highlight” tourist spots. But since we know that this grade will return in the 12th grade for a much deeper and immersive three-month experience, there is not the pressure on Na’ale to see every highlight. Instead, we invest time and effort to develop new friendships with Israeli 9th graders in Merchavim. We want to understand their life in Israel. We want to note the similarities and differences - they have cows in their backyards yet also freak out if their cell phone is missing. This year, in the hours after we had concluded our programming with Merchavim, our Na’ale students began receiving pictures and messages from their new Merchavim friends. They were in their bomb shelters as a result of rocket fire from Gaza. While disturbed by the reality that our friends in Merchavim face all too often, we marveled at the new friendships that had quickly forged and the incredible empathy displayed by our students. The Na’ale students had new family in Israel! This was really “knowing” Israel through the eyes of real Israelis and real experiences. Learning about Israel from afar is so different than experiencing it with one’s own eyes, ears, feet, and taste buds. I admire our school’s commitment to Israel learning and experiences. This should never be taken for granted. 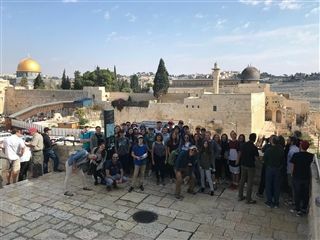 With Na’ale and Neshama (the 12th grade experience in Israel), each GOA student is encouraged to develop a deep and nuanced relationship with Israel. Study after study shows that American Jewish youth feel disconnected from Israel. That will never be the case with GOA students. From the northern border of the Golan to the southern tip of Eilat, our students engage with every sector of Israel’s population and discuss every accomplishment and challenge facing the modern State of Israel. They don’t skip from hilltop to hilltop as a Birthright trip will do, but rather drag their feet through the complex and fascinating Israeli fabric of society. Ahavat Yisrael, true love of Israel, like in our loving family relationships, is unconditional. It doesn’t mean that we are always happy or pleased or even satisfied, but there is a bond that is unbreakable. This process of falling in love with Israel (even with a taste of fresh falafel in pita that cannot be replicated in New Jersey) begins with Na’ale and will only be nurtured and nourished in the years ahead as the Israel experiences become even richer. With Thanksgiving approaching, I wanted to express my gratitude to our 9th grade parents for entrusting your students in our care for 10 days. I am also grateful to have an outstanding partner in Rabbi Meirav Kallush along with the entire team both in NJ and in Israel for making these programs such a success.